Officials are worried people may have the steaks, which were shipped to stores nationwide, in their freezers. Salisbury steak lovers should check their freezers before making dinner. 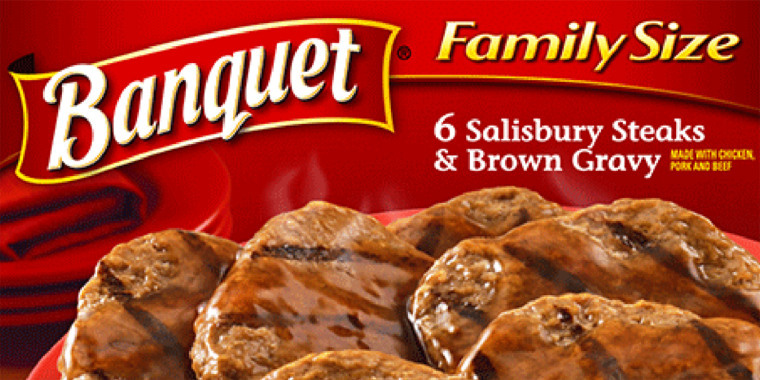 Conagra Brands is recalling about 135,159 pounds of Salisbury steak products made of poultry, pork and beef that may be contaminated with pieces of bone, the U.S. Department of Agriculture said Wednesday. The company discovered the problem after it received several complaints from consumers and three reports of “minor oral injury” from those who ate the products. The U.S. Department of Agriculture’s Food Safety and Inspection Service said in a statement that it is worried people may still have these dinners in their freezers. The steaks were produced March 10 and shipped to stores around the country. If you bought these steaks, don’t eat them! Throw them away or return the cartons to the store where you bought them. If you have any questions about the recall, call Conagra Brands Consumer Affairs at (800) 289-6014.